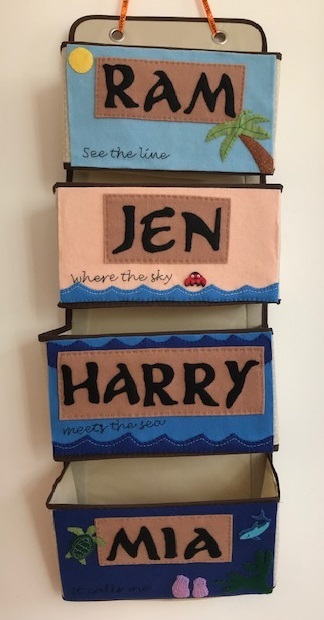 These little felt stockings are based on some that my Mum made when we were little. They are to be used instead of hanging chocolates on the tree - they are sized to fit a miniature sized chocolate bar, or they can hold several individually wrapped chocolates. First I made a template for the stockings on paper by drawing around a small chocolate bar to make sure that the sizing was correct. Then I cut out the two halves from red felt and sewed them together by hand. I cut out the trim from white felt and glued it along the top. The gold yarn has been sewn in for hanging, and the beads have been glued on for decoration. There are lots of ways that you could decorate these simple stockings - perhaps with scraps of fabric or ribbon, embroidery, sequins or buttons. 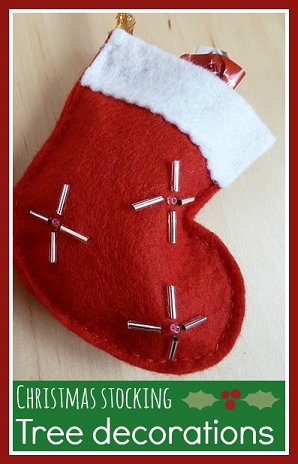 You could also make up some blank felt stockings and let your children decorate them by sticking things on. I think that they'd also make a great Advent calendar. You could make one for each day to count down to Christmas and hide a small sweet or Christmas message inside each one. This Tree Decoration post is part of the Counting Down to Christmas Blog Hop which is being co-hosted by the following blogs. See below for links to lots of other fab Christmas tree decorations! 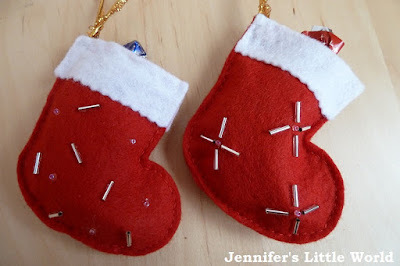 I love using felt to make stocking and crafts for holiday's. Thanks for the post.